I was not certain whether or not this photo would offend modern sensibilities. If I’m to be completely truthful, I would never have purchased it if the child in the photo hadn’t been a resident of Newark’s Italian old First Ward. The photo was purchased from a seller in one of Newark’s near suburbs. My guess is that the photo had traveled with the family as they migrated westward out of Newark. Postmortem photography is the practice of photographing the recently deceased. These photographs of deceased loved ones were a normal part of American and European culture in the nineteenth and early twentieth century. Although this practice may seem morbid to modern eyes, for our ancestors these images depict the last moment that a family would be able to grieve with their deceased loved one present. It is well to remember that in the nineteenth century that death usually occurred at home and was quite an ordinary part of life. As photography was not yet the popular medium it became, these may have been the only photograph ever made of the sitter. Postmortem photography flourished in the early years of photography among clients who preferred to capture an image of a deceased love one rather than have no image at all. These photographs served as keepsakes to remember the deceased. As the technology evolved enabling multiple images to be created from one negative it became possible to share these images with distant friends and relatives. The composition and appearance of postmortem photographs changed throughout the nineteenth century. For example postmortem photographs taken prior to the 1860s depict death as if it just happened. Most of these photographs concentrate on just the face or head. Many photographs show the body laid out, on furniture in the home or placed on a bed. The visual effect is that of the last sleep. There is no intent to deceive the viewer that the deceased was still alive but rather they were photographed to depict sleep so as to soften the sad reality that they had died. Around the mid 19th century, postmortem photographs also illustrate shifting cultural norms. This was especially true in the depiction of children. With the onset of the Industrial Revolution, children were a valued source of labor. It was not until 1836 that Massachusetts enacted laws addressing child labor. Under the law, children below the age of fifteen were required to attend school at least three months out of the year. This legislation coincided with the inception of systemized formal education for children. The new child labor laws in conjunction with the increasing value placed on formal education meant children began to occupy a different role within the family. They were no longer perceived merely as wage earners, but also as young evolving humans worthy of nurturing and support. With this changing role postmortem photographs of children also began to change. Many photographs began to include the presence of loved ones, either around the body, or embracing or touching them in some way. 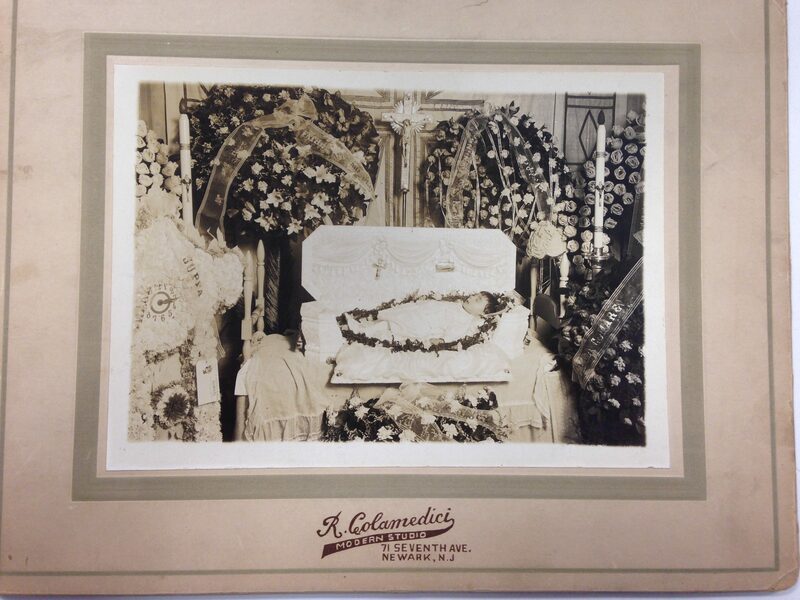 Many photographs of the dead became more indicative of what that person had been like in life. Some children would be photographed with a favorite toy or blanket. By the end of the 19th century and the start of the 20th century , funerary patterns began to shift. Embalming was first introduced on a national level and was seen widely after Abraham Lincoln’s assassination in April 1865. He laid in state for three days before being sent back home to Springfield, Illinois. His body traveled over 1700 miles from Washington, D.C. back to his hometown, with many stops along the way. Embalming required professional intervention in the funeral, which gave rise to the funeral director. Photography itself was also becoming an everyday part of life. Companies like Kodak were advertising heavily and cameras and photographic supplies were put within reach of the general public. Photos were now taken at holidays and on vacation, as well as day to day activities. With abundant opportunities to photograph the living, less emphasis was given to photographing the dead. There were simply other ways to show someone’s life other than their last moments. Postmortem photographs became less popular in the first quarter of the 20th century. Infant mortality dropped, photography captured the living and less of the dead. Shifting away from Victorian customs surrounding death, dying became medical(hospitals) and professional( funeral homes). Today, for those may snap a digital photograph at a funeral, those images usually get deleted when the longing to look has passed. As for the photographs taken in the 19th and early 20th century, they wind up on eBay like the one in this post- forever separated from the family it once belonged to.